Our Jack Rabbit Slims shirt puts a cool twist on the average graphic shirt design! Jack Rabbit Slims is the cool retro restaurant that Vincent took Mia Wallace on their "date." It's one of the most memorable scenes in the film Pulp Fiction and is what inspired this design. 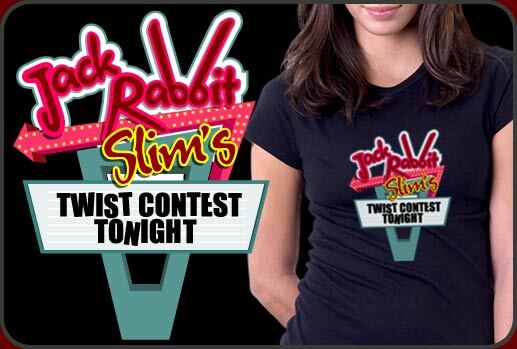 The Jack Rabbit Slims shirt is designed as a neon sign with the words "Twist Contest Tonight" under the logo. Full of fifties style this Jack Rabbit Slims shirt is perfect for any Pulp Fiction fan and it looks really great on either light or dark t-shirts. Jack Rabbit Slims is available in men's tee shirts, jerseys and tanks and we have many Jack Rabbit Slims shirts for women as well. We even have Jack Rabbit Slims for children and babies.